True Fashionista Now > Uncategorized > Fashionistas Will Love YOTEL, New York. Fashionistas rejoice and get ready for a place like no other. 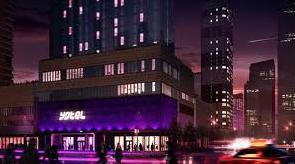 YOTEL New York, located on West 42nd Street and 10th Avenue at Times Square West, featuring 669 stylish cabins, will be the brand’s first opening outside of its current international airport locations and the largest hotel opening in New York in 2011. Some of the exciting features of YOTEL include, guests check-in at airline style kiosks, the world’s first luggage robot; a radical approach to storing left luggage, Premium Cabins with motorised moving beds for saving space, monsoon shower, technowall with TV, music and power services, workstation, free super strength WiFi, complimentary breakfast. YOTEL New York, will also feature 18,000 square feet of flexible work and entertainment space such as Dohyo restaurant, Japanese word for the Sumo wrestling platform and descriptive of YOTELS original table sharing concept. Tables lower and raise for Japanese style seating and a performance entertainment area out of dining hours. There’s also a Club Lounge with individual Club Cabins for meetings and private parties, bar and a DJ booth; Studiyo for meetings, yoga, cinema, events and parties. But wait there’s more, The Terrace, New York’s largest outdoor hotel space features two bars, pagodas, fire, and blankets for autumn evenings. TAKE A 3D TOUR OF YOTEL, NEW YORK. London Fashion Week: Preen S/S13.